This book is concerned with the issue of cultural diversity and international morality. The author asks whether cultural diversity presents an obstacle to the development of ethical codes which could be acceptable to cultures around the world. 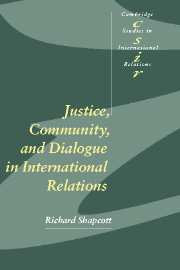 He argues that the human capacity to engage in conversation and the ability to understand each other despite linguistic and cultural differences can provide the basis for the development of a world-wide, cosmopolitian moral community. Conversation can be a moral act, in which participants treat each other as equals despite their differences.